The pear (Pyrus commnunis) is a fruit bearing tree that originated from Asia. 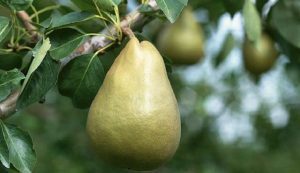 The pear tree is one of the least pretentious fruit trees, as it has low requirements when it comes to the environmental factors. Its crown has a specific shape and it can grow up to 20-m high. The bark exfoliates on the old stems and on the trunk. Its leaves are oval or round, with a pubescent petiole. The flowers of the pear tree are white and normally appear with the leaves. The pear tree is a widely known crop due to its fruits that are enriched with nutritious elements. The pear fruits contain: water, sugars, cellulose, tannin, fiber, mineral salts, zinc, copper, iron, calcium, magnesium and vitamins (A, B1, B2, B9, C, E P, K). The growth of the root system is influenced by the rootstock. If the pear tree has been grafted using along with the quince tree, the root will be poorly developed. 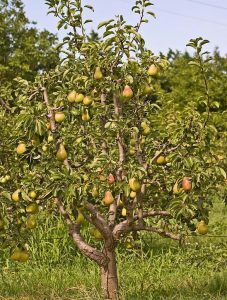 we recommend grafting the pear tree with a pear species that has a well-developed root system, that explores a large soil mass. The growth rate for the young pear trees is smaller than the one for the young apple trees. The young pear trees must have a support system installed, to prevent them from growing a crooked trunk. The central axle dominates the entire crown. The pear tree will outgrow the apple tree is size, this is why it is important to assure a proper distance between the tree rows, to avoid mutual tree shadowing. The pear tree will enter its vegetation period during early spring, a week before the apple does. Due to its slow growth rate, the production amount, during the first vegetation years, is small. The pear tree will only reach its normal fruition capacity after 5-6 years from being planted. Most of the pear species are auto-sterile (cannot pollinate themselves). This is why it is recommended to have several species planted in the garden, make sure to choose good pollinating species as well. The planting material (seedlings or seeds) needs to be purchased only from authorized nurseries or research stations. During its vegetation period, the pear tree needs more heat than the apple tree. The best results can be achieved only when the average annual temperatures range between 9.5 to 10.5 degrees Celsius. Some pear species can withstand temperatures as low as -30 degrees Celsius. The flower buds are affected by temperatures as low as -1.5 degrees Celsius. Low temperatures during the blossoming stage has negative effects on the fertilization process. The pear tree needs around 600 mm of rainfalls per year. The pear tree is resilient to the excess water from the soil. Prolonged drought will lead to a decrease of the number of fruit buds, the tree will grow small and deformed fruits. The groundwater must be located at a distance of more than 2.5 meters. The pear tree needs light and if the trees are shadowed, the fruits will have a lower quality and the plant will be sensitive to frost. It prefers deep and fertile soils, with a clay texture. The pear tree is less pretentious than the apple. The best results can be achieved in areas where the maximum temperature in July – August is 26 degrees Celsius. The parcel where the orchard will be planted needs to have a southern exposure and the tree rows need to be oriented towards north-south. 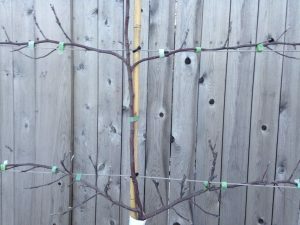 This method will assure enough daylight for the pear trees. The soil must be prepared 3 months in advance. If the pear plantation is started on a parcel that has been used for an orchard before, then the soil needs to be prepared 1-2 years I advance. To restore the soil structure and eliminate the possible diseases outbreaks, the soil needs to be planted using perennial weeds. If the soil is heavily infected by the spontaneous plants, the following herbicides can be applied: Roundup, Clinic, Taifun. The soil needs to be fertilized using 50-60 tons of organic compost. The soil needs to be then sowed at a 60-cm depth, to ease the root growing process. If this procedure is something you cannot perform, the soil needs to be sowed manually. Gather and eliminate all residues from the soil. The soil also needs to be well leveled. For a precise planting, the soil can be marked. This will help you establish the position of each tree. You can use wooden or metal stakes for the marking process. Due to the environment factors, the best planting period is during the autumn period. We don’t recommend planting the pear trees during spring as this is when they enter their vegetation period, but their wounds haven’t been healed yet and their root system is not properly developed and the young tree and dry out. For planting, make sure to use a well-developed, healthy planting material, that also has a great root system. The planting material needs to be purchased only from authorized nurseries or research stations. Before planting, the roots must be cleaned. The process needs to be done in order to remove the wounded parts of the roots and to smooth the existing root wounds. The dead roots need to be removed and the living ones need to be shortened to a 7-8-cm length. After the root clean-up process, the mulching procedure needs to be performed. Mulching the roots represents placing them into a mixture of yellow soil, organic cattle compost and water. The mulching mixture must have a sour cream like consistency and its purpose is to provide a better contact between the roots and the soil, to make sure the newly planted tree sticks to the soil. This step needs to be started by digging the hole. If the soil hasn’t been taken care of before planting, the holes must be dug 2-3 months prior to planting and must have the following dimensions 100 x 100 x 80 cm. if the soil was properly taken care of, the holes need to be dug only 1-2 days in advance, or even during the same day. If this is the case, then the holes must respect the following dimensions 50 x 50 x 50 cm. At the bottom of the holes, pour a mixture of fertile soil (from the upper layer of the soil that has been taken out of the holes) and well-decomposed organic compost. Insert the seedlings into the holes, making sure the roots are in contact with the fertile base layer. After covering the roots with 10-cm of soil, press the soil around the plants. The trees’ roots must be closely connected to the soil when planting. The planting depth must be calculated taking into consideration the grafting point that needs to be 3-cm above the soil and orientated towards north. The tree can be covered using special anti-rodent materials. Water the trees very well right after planting. Insert a supporting stake (tutor) next to each tree. Tie the tree to the tutor as it will aid the tree grown a straight and harmonious trunk. Make sure the pear crop will receive the needed water intake during spring. When it comes to young orchards, having an irrigation system is mandatory. Sow the soil around the trees superficially and cover it with vegetal residues (mulching). Mulching the trees will help keep them in a good phytosanitary condition, it will prevent the spontaneous plants from growing, it will preserve the soil water and it will reduce the number of maintenance procedures that need to be carried out. During the first year, the tree needs to be shortened to an 80-cm length, during spring. Once the tree has entered its vegetation period, all buds up to a 50-cm height need to be eliminated. Choose 3-4 sprouts evenly placed on the superior part of the tree as the first layer of the crown. Cut off all other sprouts from the plant. During the second vegetation year, the chosen sprouts need to be shortened to a 50-cm length, above a bud that is oriented towards the exterior. The extension branch of the axle must be 25-cm taller than the crown’s first layer. This can be corrected by applied a cut above a bud that has an exterior orientation. Leave 2-3 extension branches on the 3-4 chosen main branches. The rest of the growths must be taken out. 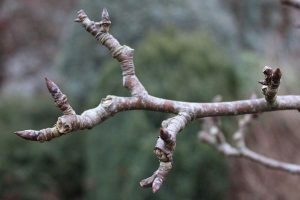 During the third year, during early spring, the extension buds of the main branches must be shortened to a 50-60-cm length. These cuts need to be applied above bud that has an exterior orientation. Choose 3-4 branches on the main axle to form a new layer of the crown. Competing branches and the ones that shadow one another must be taken out. The branches that have remained on the axle need to be shortened to a length of 10-15-cm in order to bear fruits. During summer, take out the greedy sprouts, the compete branches and those located on the superior side of the main branches. During the fourth year, the tree’s length must be reduced to 2.5-m by applying a cut above a branch that has an exterior orientation. The growing bud located on the tip of the central axle is dominant. This is why the pear tree always grows very tall. After cutting, the tree must be well aired, the solar radiation must reach all branches. The cuts from the following years need to start by taking out the weak, dry, broken, ill branched. All sprouts located inside the crown, that have a luxurious growth need to be taken out. 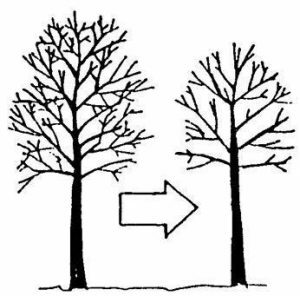 Leave 5-6 new branches on the main branches (if these have room to grow and will not be shadowed). The new branches that are longer than 60-cm need to be shortened to 70% of their initial length. By cutting the pear, this also stabilizes the fruition process. The fruit-bearing branches are shorter and have one bud on their tips. The bud is easily recognizable as it is large and bulging. Complex fruit-bearing formations will grow out of this bud. All cuts need to be performed at a 45 degrees angle. This is how the water will easily drain from the wounds. If wounds larger than 2-cm were formed while cutting, these will have to be covered using mastic. During summer, a few airing cuts can be applied. Take out all greedy sprouts as these consume the necessary sap for fruition. To differentiate the fruit-bearing buds and to reduce the growths, take out the tips of the young buds. – Tilting the branches: this represents changing the branches’ positions by making them grow horizontally. This increases the fruit-bearing buds on that particular branch and it airs the crown. The branches can also be tilted below the horizon point if you want to have an abundant production. This process needs to be performed during the young life stages of the trees, when the vegetative growths are predominant. – Arching the branches: this branch changing procedure makes the branches have an ascending base part and its tip part tilted beneath the horizon point (descending). This process will increase the branch’s vegetative growth and its garnishment. The trees that have had their branched arched will bear fruit 2-3 earlier. – Distorting: this process consists of twisting a branch or a sprout. This stimulated fruition. – Breaking the branches: this needs to be done only for the branches that have an improper orientation. The fruition process will start quicker on trees that have had their branches broken. The distance between the tree rows must be kept clean. The spontaneous plants compete with the trees for the soil water and nutrients. This is why these must be taken out. You can mill them using the milling machine, as this will enrich the soil with organic matter. The most common solution is applying herbicides. A wide range of herbicides can be used: Centurion, Agil, Fusilade Forte, Panterea, Leopard. The herbicides must be carefully applied, as their vapors must not reach the tree leaves. During the first 3 vegetation years of the pear tree, no herbicides must be applied. 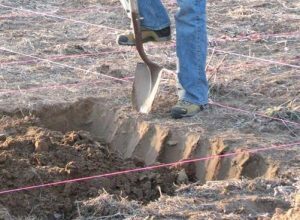 If there is an irrigation system set in place, the distance between the tree rows can be planted using onion, garlic, salad, radishes or fruit-bearing shrubs (sea buckthorn, raspberry, blackberry, etc.). After the trees have entered their vegetation period, the following days will be crucial if the climate is capricious. Considering events from last years, the number of late frosts has increased. To protect the trees from these temperature variations, the fumigation procedure can be performed. This consists of burning easily ignitable materials that produce a large smoke quantity. Example: rubber, hay, organic compost, oily residues, peat, etc. Place these materials as piles. Use around 80 to 100 piles per hectare. This process can protect the tree against temperatures as low as -3 degrees Celsius. Usually, the pear tree reacts well to organic fertilizers. Depending on the age of the plantation, periodically (once every 2-3 years) apply 20-30 tons of organic compost per hectare. If this is something you cannot procure, you can replace the organic compost with 300 kg of complex NPK fertilizer that needs to be applied annually. After fertilizing, the soil needs to be sowed at a 20-30-cm depth. The pear trees also react well to leaf fertilizers. Products to be used: Cropmax, Amalgerol, BlackJak, Terra-Sorb. 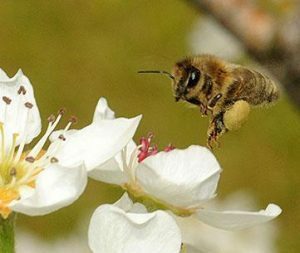 Pollinating the pear orchards is problematic. The pear flower nectar has a low sugar content, therefore, the bees are not attracted by it. Another reason for bees not being interested in pear tree flowers is that these blossom during a cold and humid period. You can settle this matter by placing bee hives in the pear orchard. 3-4 bee hives need to be used for one orchard hectare. Irrigation is mandatory for the young orchards, or for those that have low rainfalls. The best results can be achieved by using localized irrigation and drip irrigation. This reduces the probability of leaf diseases. The pear orchard must be irrigated as many times as needed. We recommend using 400 cubic meters of water per hectare per watering. Be very careful when it comes to the diseases and pests that can affect the pear tree. A healthy orchard will constantly produce fruits and it will have a longer life expectancy. Making sure the pear orchard stays healthy can be done by applying all phytosanitary treatments on time. Cuts, preventing the spontaneous plants and extra fertilizing can reduce the probability of diseases and pests. 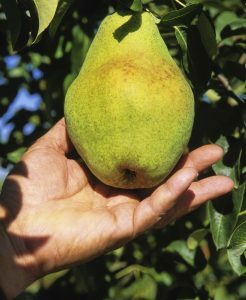 For more information about the diseases and pests that can affect the pear orchard, as well as information about the proper prevention means, please click here. The orchard must be kept clean. Gather the leaves and fallen branches, clean the tree branches using a scrubbing brush as this will eliminate the pests’ eggs, mosses and lichens. After this has been performed, the trees can be treated with builders’ lime (calcium hydroxide). The builders’ lime will prevent pests and the growth of mosses and lichens. The builders’ lime also protects the tree against solar burns. Another solution for decreasing the probability of diseases and pests is to the treatments applied during the vegetative rest period (winter). The pests that spend the winter as eggs (lackey moth, aphids, acari), or on branches, or inside the tree barks (European fruit lecanium) can be successfully prevented. These treatments need to be applied during the beginning of winter, when the outdoor temperature exceeds 5 degrees Celsius. When it comes to diseases, the first treatment (after the flowers have fallen off) needs to be applied using copper-based products. The second spraying using copper-based products needs to be done during spring, when the buds open up. These substances need to be dissolved in water and sprayed to the entire tree surface, from the base to the tip of the branches. The following products can be used: Zeama Bordeleza, Champ, Funguran. These treatments need to be applied during sunny days, when the outdoor temperature exceeds 6-7 degrees Celsius, as these treatments must not freeze on the trees. 7-10 days after these copper-based treatments have been applied, spray the trees using horticultural oil (150 ml for 10 l of water). Products to be used: Confidor Oil or Ovipron. The summer and autumn pears need to be harvested 7-10 days prior to their consumption maturity, once they have reached the specific species color and dimension, because of their high perishability. If the pears are harvested when fully ripe, the pulp is soft and the fruits cannot be stored or handled. 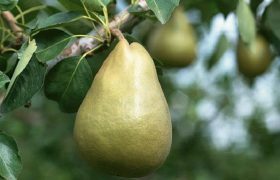 The winter pears need to be harvested as late as possible, to allow them to gather a higher sugar quantity and aroma. The pears can be stored up to 1-2 months inside dark warehouses, at 4-5 degrees Celsius.